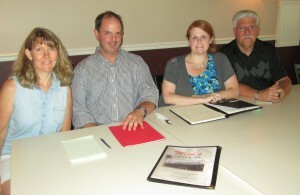 Pictured are committee members Ellen Himes, Doug Moore, Nicole Baldwin, Tom Brown. Recently, members of the Fulton Public Library Capital Campaign committee met at Mimi’s Drive-In to discuss plans for their upcoming chicken barbeque on August 30 at Bull Head Point in Fulton. Committee members are working to raise money to give the Fulton Public Library a much needed facelift. Tickets for the August 30 BBQ can be bought from any board member or at the Public Library.